Sherri Briller, Associate Professor of Anthropology at Purdue University and former AAGE President (2009-2010), recently was elected the new President of the Society for Applied Anthropology (SfAA) and, earlier this month, she stepped into that new role. 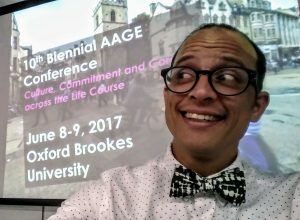 “AAGE is a great model of a friendly organization where students, faculty, and practitioners interested in aging build personal and professional connections that can last a lifetime. As someone who came up through AAGE, I deeply value and bring that sensibility to my new role as SfAA President. How might we foster similar kinds of close and meaningful interactions in the broader Society? “I’m especially interested in the future of anthropology education and how we can prepare people to develop long-lasting impactful careers. I have found that having a gerontological and life course perspective is very valuable for thinking about sustainable career development and can help with developing new educational and outreach initiatives. These are some of the ways that my long-term involvement with AAGE meets up with my new leadership position in SfAA. Congratulations, Sherri! We’ll all get to work on thinking of ways to support and build on this new connection between AAGE and SfAA. You can read more about Sherri and her vision for SfAA here. Current AAGE President and Senior Lecturer in Anthropology of Japan at Oxford Brookes University, Jason Danely has been awarded a 1-year 2018 SSRC Abe Fellowship for a project titled “Comparison of older ex-offender resettlement and community-based organizations for reduce the recidivism in Japan and the United Kingdom.” The project will examine the role of third sector organizations (non-governmental/charity organizations) in supporting the re-entry and resettlement of older ex-offenders. The comparative approach will highlight the differences in both policy approaches and cultural attitudes toward formerly incarcerated older adults and the emerging care-carceral continuum contributing to recidivism. Anna (Anne) Velardi, graduate student at the University of Alaska Anchorage, recently defended her Master’s thesis in cultural anthropology. Nice work, Anne! Differential treatment due to age has contributed to the prolonged unemployment of adults over 40 years old. Being labeled as “old” appears to be an entry point into differential treatment, but there have been few systematic studies of how we recognize someone as old. Using a social constructionist model, this study examined the following research questions: how “old age” is recognized and constructed by different groups of people in Anchorage, Alaska; how those constructions compare to constructions of age in national advertising media; and how those constructions are meaningful in the lives of older Alaskans, especially in the context of both looking for employment and within the workplace. The study used the concept of “cultural age markers,” those individual attributes, embodied or disembodied, that members of a culture use to recognize an individual as “old” or “older” to investigate these issues. Free listing revealed a list of characteristics that were coded into the following categories: Body/Physical Appearance, Personal Attributes, Health, and Time. Many of the age markers were revealed in national magazine advertising and were salient in the experiences of older Alaskans both in their job search and in the workplace. However, it was not clear if the cultural age markers revealed are merely stereotypes about older people or are the actual mechanism by which Alaskans recognize someone as “old.” The cultural age markers listed in the study should form the basis for further study of the issue. AAGE Members also have had a number of publications over the past few months. Way to go, everyone!! Nancy Eberhardt, Professor of Anthropology at Knox College, has published a paper, entitled “Caught in the Middle: The Changing Role of Buddhist Meditation for Older Shan Adults,” in Contemporary Buddhism, Volume 18, 2017 – Issue 2. In this paper, I examine the role of Buddhist meditation and other ascetic practices in the lives of village elders in a rural Shan community in Mae Hong Son province, Thailand. My focus is not on the techniques used but rather on the larger social and cultural context in which the practice occurs. Traditionally, the taking on of ascetic practices by village elders has been associated with moral development and enhanced psychological and emotional well-being. I describe recent changes in these practices, including their differential significance for middle-aged women, and consider the implications of these changes for local understandings of the ‘normal’ course of human development. I explore the complexities of moral experience during the phase of life after a terminal diagnosis by examining the experiences of one woman living as a hospice patient in St. Croix, US Virgin Islands. Introducing the notion of “existential ambivalence,” I show that this can be a period of deep uncertainty, in which what matters to individuals can shift and fluctuate through time, not necessarily lining up with collective ideals of “the good death.” I focus on a promise this woman made that continued to pull her toward a version of living well while she was also pulled toward dying. Frances Norwood, Assistant Professor of Anthropology at George Washington University, has a new publication coming out this month. Norwood, Frances. 2018. The New Normal: Mediated Death and Assisted Dying in the United States. In A Companion to the Anthropology of Death. Antonius C. G. M. Robben, editor. Hoboken, NJ: John Wiley & Sons. Have you ever wondered why so much of U.S. television programming focuses on extraordinary forms of death and dying (e.g., CSI, The Walking Dead) and atypical stories of heroic medicine (e.g., House) and yet ordinary death (death by decline) is virtually non-existent? In a new anthology of death, Norwood uses prime time television series, Internet search patterns, and news programming to examine cultural shifts in views around death and how that may be impacting the uptake of new laws on physician assisted dying in the U.S.
Aaron Seaman, Postdoctoral Research Scholar in General Internal Medicine at the University of Iowa, has an article, entitled “The consequence of ‘doing nothing’: Family caregiving for Alzheimer’s disease as non-action in the US,” which recently appeared in Social Science and Medicine. This article adopts a discursive approach in order to examine how dominant US discourses shape both public and personal understandings of the caregiving work that families do, specifically in the context of Alzheimer’s disease (AD). Family caregivers are an essential, increasingly recognized piece of the US health care system. Dominant discourses of AD and caregiving articulate family caregiving in contrast to biomedical intervention. The dichotomy privileges the ability to affect a biomedical outcome and, using that metric, minimizes caregiving’s potential value as meaningful action. Family caregiving comes to be seen as what I term non-action, action that, while voluminous, is not perceived as meaningful in terms of its outcome. Drawing on over 26 months of ethnographic fieldwork in the Midwestern US with families living with early-onset AD (2011–2013), I focus on spousal caregivers to trace how these discourses shape the possibilities for family caregiving. I show how advocacy rhetoric is taken up and reproduced by family members, who learn to see their own caregiving labor through a biomedical lens. However, I also demonstrate that, obscured by dominant discourses, caregivers engage in relational labor, the continual work of making and unmaking social relations. Recognition of caregiving as part of longer-term relational endeavors, I argue, offers the potential to reframe caregiving discourses and reimagine the value the labor of caregiving as meaningful in its own right. That’s all for this round. Again, congratulations to everyone! And, please, continue to send me your news — about everything from jobs to grants to projects to programs to publications and everything (to do with aging, that is) in between — at aarontodd11 (at) gmail (dot) com! Well done everyone for your impressive achievements! Great to know what our members are getting up to, whether that means publications, honors, or successfully defending a PhD Thesis. To echo Aaron, the wonderful news of Sherri’s election to President of SfAA underscores the longstanding connections we have had to professional and practicing anthropologists and I hope that through mentoring and sharing resources we can build and strengthen these links. Academics are increasingly encouraged to provide evidence of ‘impact’ and to involve stakeholders in a meaningful way throughout the research process, and applied anthropology has a huge knowledge base to inform our work.